Halloween is one of my family’s favorite holidays. When else can you legitimately walk around the neighborhood dressed as a zombie without someone calling 911? In preparation for Halloween, we’ve gotten all our favorite decorations out of storage and have begun to hang skeletons, bats and spider webs throughout the house. 5 years ago, I took my children to Target the day after Halloween (cause everything is half-priced the day after whatever holiday it’s intended for). My then 4 year-old son found a child-sized, talking skeleton among the clearance items, immediately named Mr. Bones and placed his new buddy in a seated position in the cart next to him. Little Logan watching cartoons with Mr. Bones shortly after we brought him home. That skeleton went with us EVERYWHERE for many months. He ran errands with us every day. Did I mention that this was during the phase when my son insisted on wearing his full Spiderman costume (including the facemask) all day, every day, and my toddler would only wear her light-up Cinderella dress? Well it was. On more than one occasion the kind employees at the drive-through of my bank offered us an extra sucker thinking the plastic skeleton seated between Spiderman and Cinderella was another child (probably assuming that I either had one doozy of an ugly baby or the crazy woman driving the vehicle dressed her infant in a skeleton costume in mid-November). 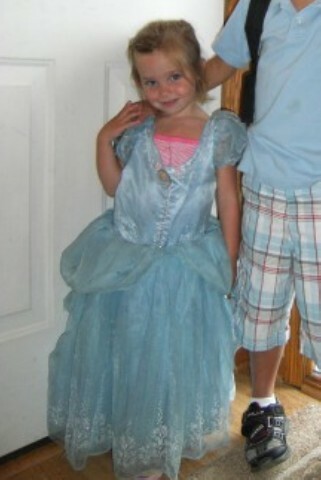 Little Ella in her favorite Cinderella dress. FYI if you ever consider buying your child a dress that has lights in it, you should know that you can’t just toss it in the washer. And if your child chooses to wear that light-up dress every day, everywhere, no matter what, that bad boy is gonna get more than a little dirty. Shortly after Christmas that year, I managed to hide Mr. Bones away, but mid-September every year (when I can no longer stand to listen to my children’s pleas to start decorating for Halloween), he comes back out and he never fails to become my children’s bony BFF. I can’t seem to find a picture of little Ella with Mr. Bones, which I almost can’t believe because she became so attached to him that she slept with him every night (imagine me tucking in my 2 year-old with her skeleton friend, kissing them both on the forehead – that’s totally normal, right??). She even insisted on bringing him to my in-laws for Christmas one year (cause nothing says “peace on earth” quite like a fleshless, child-sized doll)! Just last week, our youngest daughter Brielle discovered the joy and fun of having a skeleton buddy who is just her size. She loves to have him sit beside her at the table while she has a snack or snuggle up next to her while she plays on the Nook. I’ll admit it’s a little creepy to walk into her room and find her reading books to a skeleton, but when she tenderly rubs his skull and lovingly kisses his mandible, it’s hard not to find it more adorable than macabre. 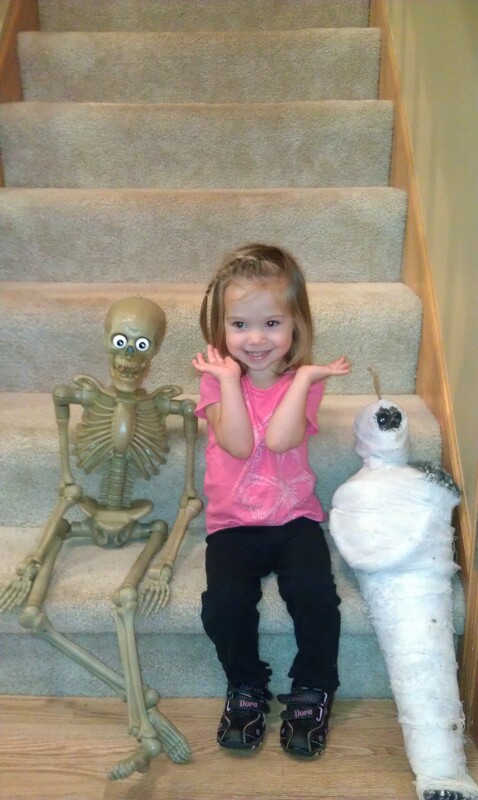 Brielle striking a pose with Mr. Bones and a mummy she’s convinced is his mommy. 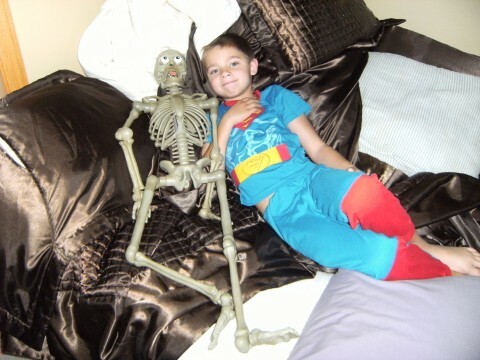 I’m pretty sure my children will have far too many fond memories of playing with Mr. Bones – yet another reason I’ve promised to pay for whatever therapy bills they rack-up once they reach adulthood. Now to the contest! In honor of Halloween, I’d love to know your favorite childhood Halloween memory. Maybe it was a super-awesome Halloween party your mom let you have one year or a costume you wore that totally rocked. At the end of the month, I’ll randomly draw a winner and send them a book of their choice from my collection of autographed books! Paranormal researcher and author Chad Lewis (www.chadlewisresearch.com) just donate and signed one for the cause last weekend! So share your stories! I can’t wait to read them! This is funny. Light up dresses should never be washed. My favorite Halloween was the one where my mom, who has zero sewing skills, made our costumes out of poster board- I was a Queen of Hearts playing card. That’s hilarious! Love Halloween! I remember a Halloween party where we made our own intestines, eyeballs, clammy hands! One of the best hallow wens ever! Keep your blog coming love reading it! Why is it the gross stuff is always the most fun?! I still LOVE making intestines and eyeballs with the kids…little smokies make great chopped off fingers/toes! 🙂 Thanks for sharing your memory, Maren!! Mallory has the same light-up Cinderella dress! We need to get those two together. They would totally be BFFs! 🙂 We might have to try to coordinate a playdate the next time we’re both back in Algona!! We love this time of year so much that we do it twice a year. I don’t know why I haven’t written a book about it yet. I think I will. Thank you Jess. Memorable or favorite. Memorable…would be the Halloween I was about 5 or so. I went trick or treating with two pails… two pails you ask? Well I was sick. Not sure why on earth my Mom agreed I could go especially with two pails guessing because I had older siblings and my Dad was milking cows so could not watch me. Thinking back I am not sure how I handled making sure the right pail was out for the trick and treat part at each door… yes I can also tell you what my last meal was that night and I am still not a fan of it and only have had it three times in my life.